There's little hard information on the subject--and some of the evidence is conflicting--but it seems logical to say that a disorganized office leads to a lot of nonproductive time spent looking for stuff. One study from Brother found that workers waste, on average, 76 hours per person per year looking for misplaced items on their desks. And years ago, NEC-Mitsubishi said that cluttered desks can cause mental and physical stress, both as a result of frustration with the mess and owing to poor posture while working around all the junk. The data isn't exactly scientific, but having a clean and organized working area is surely a good idea for any small business. Even if it isn't better for your own sanity, think of it in terms of the impression you give to clients and customers who visit your premises. A sloppy office telegraphs an unappealing message to visitors "I do sloppy work." A central premise of most organizing and productivity strategies is to minimize the amount of time you spend dealing with paper. Whenever you pick up a piece of paper, make an immediate decision about what to do with it: Act on it, delegate it to someone else, file it, or throw it away. But don't just drop it on your desk. The vast majority of paper on your desk is probably trash, with a smaller percentage of material that you should keep in a file. NeatReceipts can help you digitize and organize a shoebox of receipts. Dealing with what remains ought to be part of the work you do during the day, with the goal that?by the end of each day?your desk will be clean. This is a powerful way to help you start the following workday with a clear head instead of a feeling of being overwhelmed. Going paperless isn't terribly difficult today. The first step is to convert paper documents to digital form. Sign up for e-billing for utility statements, encourage contractors to send invoices via email, and use do-not-mail lists to cut down on junk mail. While you're at it, use your various service providers' privacy setting systems to opt out of receiving marketing messages. Next, you need a plan to deal with paper documents that you do receive. 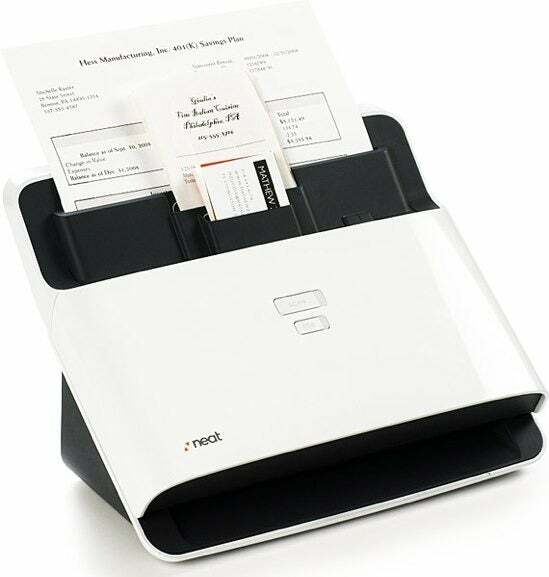 Any scanner and OCR software package can do the job for you, or you can invest in something more specialized, such as a Neat Company scanning device, which has feeder slots for documents large and small. Drop your receipts and paper invoices into the device, and then discard the paper after the scanning is done. You can scan business cards with a standalone device or with an app such as WorldCard Mobile. A word of warning: With some banks, older financial documents may not be available for printing on demand. Relevant laws may require you to retain of financial records for up to seven years for tax purposes, so if your bank doesn't provide long-term archiving, you must either archive the PDFs yourself (on your own computer) or keep paper copies. Of course, you should kep your file cabinets organized, too?by year, account, or topic?and purged annually. What about all those notes you take during the day? Countless business owners have notebook after notebook filled with to-do lists, product ideas, meeting notes, and other ephemera, none of which are ever referred to again. Instead, the notebooks clutter up desk drawers and bookshelves, hogging space and gathering dust. Besides getting extra junk off your desk, going digital organizes your collections of extemporaneous thoughts into something more coherent and useful. 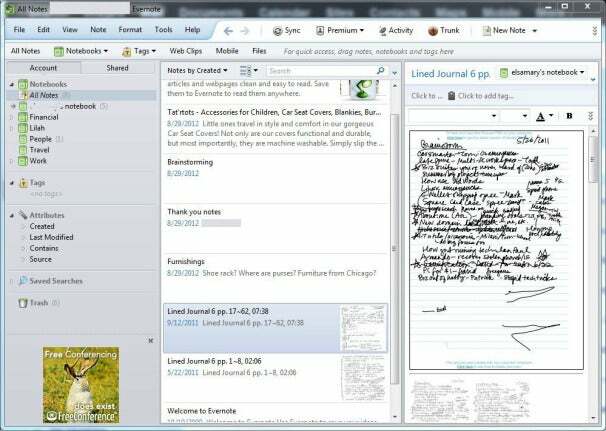 Evernote has quickly become the de facto industry standard for this kind of task; a special version of the program for business users who want to share information with multiple users is due in December. Microsoft devotees may prefer OneNote. Not into tapping away on a cell phone screen? Use a voice recorder app to save audio messages to yourself. Better yet, use dictation software like Dragon NaturallySpeaking to convert your musings into text. It may not be perfect, but neither is your handwriting. Now that you have an array of digital documents, what do you do with them? 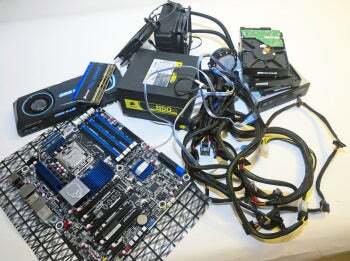 Your computer should be as organized as your desk; otherwise, you've just moved the mess from a physical place to a virtual one. A charging hub, such as the Bluelounge Sanctuary, can cut clutter. Start with your desktop. For many users, the desktop is a wasteland of forgotten applications and random files from years gone by. Organize the area just as you would your physical desk: Uninstall the apps you don't need, delete the cat pictures you've downloaded from Facebook, and put the rest of the stuff into folders. Your system's Documents, Pictures, and other user-specific folders are the best place to park your data, because Windows is configured to index those areas for searching. Folders should follow a natural hierarchy (such as "Employees > 1099 Contractors > Bob Smith" or "Financial Statements > BofA > 2012"), and you should keep them tidy enough to avoid having to scroll to see the contents of any given folder. If a folder gets too large, split it into natural subfolders. And remember, the more descriptive the name of each file or folder is, the easier it will be to find it later. Next, do the same for your inbox. Using your inbox as a catch-all for every message you've ever received is great if you like to send lots of "I didn't see your email" apologies. Otherwise, it's a nightmare waiting to happen. Some well-organized people make an empty inbox an everyday, end-of-day goal; they move anything not addressed that day to a calendar item. Others try to keep their inbox nearly empty, allowing one message to remain for each major to-do item. With my inbox maintained at a manageable 6 to 12 items, I can see at a glance what projects I need to work on next. Ironically, technological convenience works against you in this quest. In fact, Google's official position is that searching for documents is easier than filing them, which is why folders get minimal attention in Gmail. In my experience, however, spending extra seconds each day organizing my digital life is time well spent. Why? Because while search may help me find a message, it won't ensure that I see it in the first place, and it may scroll off the bottom of the screen so quickly that I never read it in the first place. Evernote, which runs on most platforms, helps you keep track of ideas on the go. Not all mail clients and OSs treat search the same way: Windows 7 doesn't index Outlook's "Deleted Items" folder, for example. As a result, you can search Outlook's trash folder manually within the client, but not from the Start menu. This doesn't have to look familiar. With all of the attention paid to organizing paperwork, it's easy to forget about the other things piling up on your desk?including tchotchkes, hardware, peripherals, and cables connecting everything. Here's how to keep the clutter in check. First, declutter. Just as most of the paper on your desk is garbage, so are the food wrappers, souvenirs, dead pens, and mementos from vacations gone by. Keepsakes are fine, but having too many on your desk gets in the way of your work. If you don't touch something on your desk at least once a week, find a better place for it in a closet or drawer. Charging systems like the Bluelounge Sanctuary can help cut down on cable clutter and keep mobile devices organized, easy to find, and within reach when you need them. A docking station can give your laptop a more permanent and functional home. Don't have a docking port? Use a laptop stand to prop your display up at a better height. You can control unruly cable with twist ties or custom cable management tools so that the wires don't tangle and bunch up on your desk. Newer printers have much smaller footprints than those of yesteryear. Invest in a new model and remember that a multifunction printer can do the job of up to four devices, saving loads of space.